Very good about the dogs. Must make a huge difference on Vet Days. Our office desks are lined up in banks, each with the uniform screen, hub and plug in points. I try not to work in there at all. Feel like a battery hen when I do. 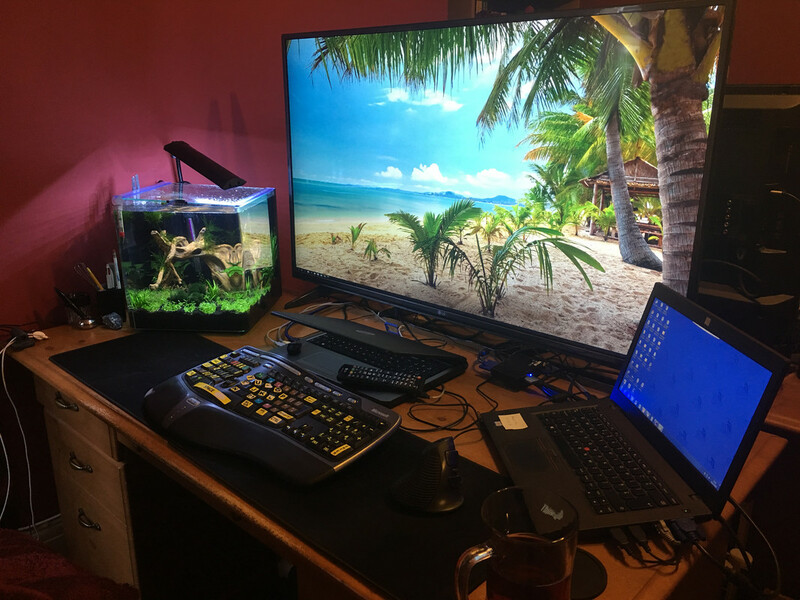 Had to move the central laptop into the middle to make room for the new tank, but since I have both laptops plugged into the big screen and work on that, it makes no difference really. I'm going to have to get an all black heater, and move the thermometer, but otherwise it is really just a case of waitng for the plants to fill out and the nitrogen cycle to be ready for an occupant. Thanks, I've grown up growing Orchids so visual presentation has been with me a while. Ok so I have a couple of shots of Kojin from Yesterday, sadly wasn't able to upload at the time show am doing this now, this is Kojin in his role of "Cat TV". The Cat is named Gable, he is at least 8 years old and has partial blindness (another Rescue). I've not seen Kojin flare at him yet and Gable doesn't seem all that interested in Kojin. The Cory Cats however, a different story. Then we have a couple of shots of Ouro from this morning, his fins look like they're slowly healing and no new bites. YAY!! What is it with you and rescues? I swear every animal you have is rescued! Gable is soo cute, love that he ignores Kojin and focuses on the Cory Cats. Do you think that he has issues seeing Colour as well as partial blindness? Don't you have another Cat and Dogs? Do they do the same? Is that a Flare mirror I spot as well? Yeah I have only bought 1 Animal, that was my Dog Dave. I was hammered in London and bought him from Harrods! I'm not really sure, sometimes he can see toys other times he can't see when I have moved the sofa, its all a bit hit or miss. Plus he is a little bit stupid. Although I did have to polish paw prints off Kojin's tank this morning. So clearly someone is interested, Gable or Blossom I have no idea. Then there is Dave, he is more interested in getting into my bins than anything else in life. And sleeping, Dave loves to sleep. Ouro looks sooooo much happier than last week! And cat TV is a great thing. We have a shih tzu who stands on the sofa arm staring into the tank for a few seconds, several times a day - but her attention span is so short that you couldn't actually call it TV. More like 'wassat? ooh, wassat other thing? ooh, wassat out the window? ooh, wassat in the other room?' Whole process takes maybe 10 seconds. lol. Thanks, I was worried about him over the weekend. Very relieved to see him this morning being active. He doesn't come to me yet, whether he doesn't recognise me yet, doesn't like me yet or is a grumpy boy I have no idea but I hope that'll come. He's working nicely on his flaring, but swimming with a damaged dorsal fin seems to cause him issues as he does seem to "topple" in the water, but my my does he have a turn of speed on him!! Well, it has been a little hectic for me since I last updated this Journal. Had a great but stressful Festive Period with some Foster Kittens (nightmare) which sadly and also thankfully have been re homed. I also has to say goodbye to my Dog Dave (Cane Corso) who I had for 11 years (rescued so don't know actual age) as well as the insane return to work after the shut down period. Kojin is back on my Office Desk, today I am looking to pick up either some RCS or Amano as well as a Nerite or Ramshorn snail. 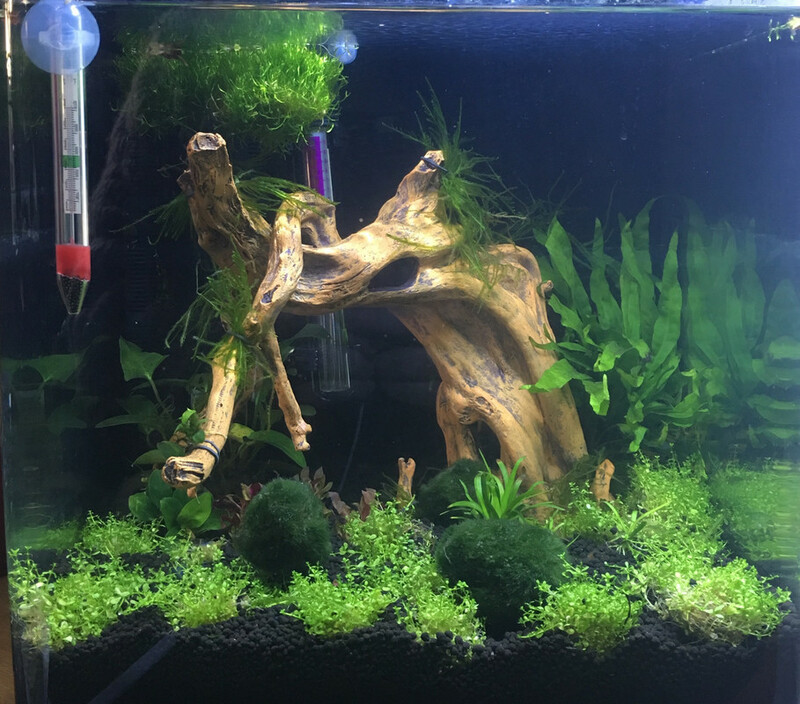 Sadly his light went Yesterday however he and the plants should be fine for a few days until I get a replacement, this has been ordered and i am currently awaiting delivery. Ouro is currently in my 3 Gallon at home, his fin biting is getting a lot better and can currently see a lot of new growth (transparent but clear edging on fins) however the downside (for me) of this is that he is a speedy little bugger and doesn't stay still for too long so Photographs are hard to take! The final photograph shows Ouro and his own Personnel Trainer Gable, Gable is obsessed with the Fish tank and any movement within it, as you can see Ouro does like to flare at him (I keep this to a minimum due to potential stress issues). I think I might flare at a giant cat head like that one! lol. Very sorry to hear about Dave. Breaks your heart when they go, especially after being a wonderful companion for so long.